Black holes are famous for their muscle: an intense gravitational pull known to gobble up entire stars and launch streams of matter into space at almost the speed of light. It turns out the reality may not live up to the hype. University of Florida scientists have discovered these tears in the fabric of the universe have significantly weaker magnetic fields than previously thought. A 40-mile-wide black hole 8,000 light years from Earth named V404 Cygni yielded the first precise measurements of the magnetic field that surrounds the deepest wells of gravity in the universe. Study authors found the magnetic energy around the black hole is about 400 times lower than previous crude estimates. The measurements bring scientists closer to understanding how black holes' magnetism works, deepening our knowledge of how matter behaves under the most extreme conditions — knowledge that could broaden the limits of nuclear fusion power and GPS systems. The measurements also will help scientists solve the half-century-old mystery of how "jets" of particles traveling at nearly the speed of light shoot out of black holes' magnetic fields, while everything else is sucked into their abysses, said study co-author Stephen Eikenberry, a professor of astronomy in UF's College of Liberal Arts and Sciences. The jets are nature's very own Death Star beams – ultra-powerful jets of energy that shoot out from the vicinity of black holes. "The question is, how do you do that?" Eikenberry said. "Our surprisingly low measurements will force new constraints on theoretical models that previously focused on strong magnetic fields accelerating and directing the jet flows. We weren't expecting this, so it changes much of what we thought we knew." 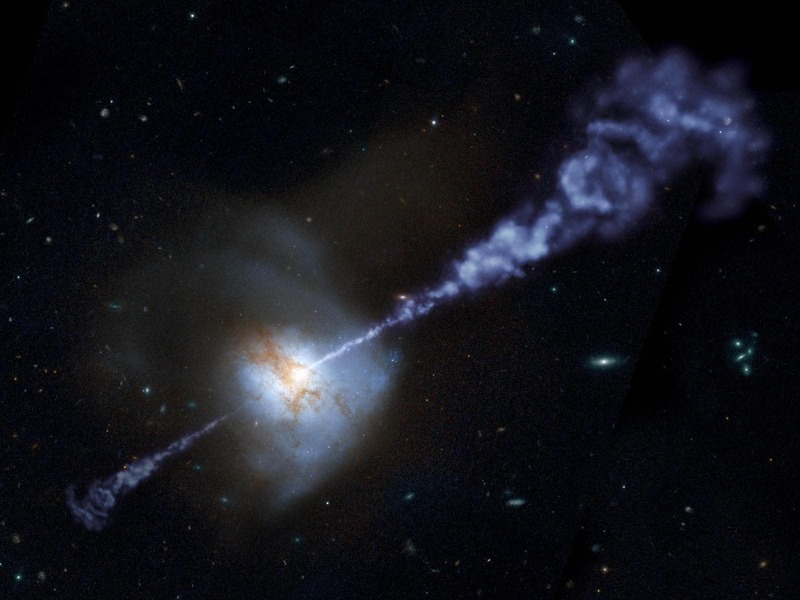 Study authors developed the measurements from data collected in 2015 during a black hole's rare outburst of jets. The event was observed through the lens mirror of the 34-foot Gran Telescopio Canarias, the world's largest telescope, co-owned by UF and located in Spain's Canary Islands, with the help of its UF-built infrared camera named CIRCE (Canarias InfraRed Camera Experiment). Smaller jet-producing black holes, like the one observed for the study, are the rock stars of galaxies. Their outbursts occur suddenly and are short-lived, said study lead author Yigit Dalilar and co-author Alan Garner, doctoral students in UF's astronomy department. The 2015 outbursts of V404 Cygni lasted only a couple of weeks. The previous time the same black hole had a similar episode was in 1989. "To observe it was something that happens once or twice in one's career," Dalilar said. "This discovery puts us one step closer to understanding how the universe works."